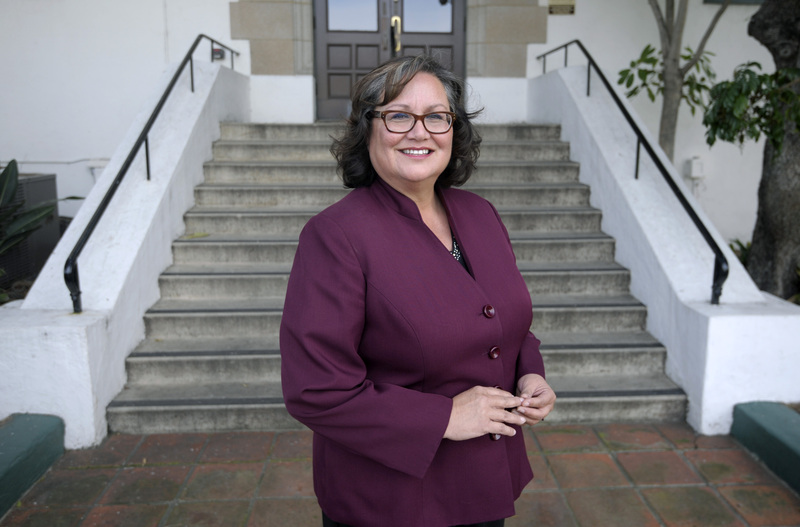 NEXT LEVEL: Cathy Murillo, the first Latina elected to the Santa Barbara City Council, now has her sights set on the mayorship. Murillo, 56, enters the mayoral race in a fashion similar to her style on the dais: energetic and first out of the gate. “We want to get the momentum going early,” she said Monday. So far, no other candidates have filed the necessary paperwork to run, though a handful have expressed varying degrees of interest. Murillo was first elected to the council in 2011, and then in 2015 won the seat to represent the city’s Westside neighborhood — where she’s lived as a renter for 16 years — under the new district-election system. This November, three council seats will be on the ballot as well as the at-large mayoral race. One of the more consistent voices in City Hall for working-class Santa Barbarans, Murillo has made it a point of pride to organize and participate in a dizzying number of community meetings, from neighborhood-watch workshops to business-creation roundtables to environmental study groups. “The only job I have is doing the city’s work,” she said. “I don’t just approve budgets. I’m out in the community learning things all the time.” According to Murillo, her achievements on the council include helping to pass the plastic-bag ban, hire a new police chief, reopen city libraries on Mondays and renovate the Children’s Library, and defeat Measure Y and preserve the Arroyo Burro Open Space. On her own, she created the Pro-Youth Movement in response to the city’s proposed gang injunction, arguing for intervention as a more effective means of reaching vulnerable Latino youth. Since then, gang-related crime has dropped 75 percent, said Murillo, who has also been a part of the South Coast Task Force on Youth Safety. “I take credit for that.” More recently, she’s taken up the cause of RV residents anxious over a new law banning them from parking their homes on city streets, and she is working to re-energize the Westside Community Group with initiatives such as an adopt-a-block program that she hopes spreads throughout the city. This Friday, Murillo will receive the 2017 Santa Barbara County Woman of the Year Award from State Senator Hannah-Beth Jackson. As mayor, Murillo said, she’d focus on job creation and economic development, specifically for small businesses, emerging technologies, and renewable energy as money and opportunity shift away from oil and nuclear production. Murillo also said she wants to help bridge the north-south county divide with more regional cooperation while at the same time righting Santa Barbara’s chronic jobs-housing imbalance. “Everyone agrees we should have more and better-paying jobs,” she said. Larimore-Hall is not excited, however, about the distinct possibility of other left-leaning candidates joining the race. “Democrats need to learn math,” he lamented. “Too many Democrats in this race means a Republican mayor for Santa Barbara.” Current mayor Helene Schneider, who ran last year in California’s 24th Congressional District primary, finishing fourth, will term out in November. Though he hasn’t officially thrown his hat into the ring, former mayor Hal Conklin is crouched in the starting blocks to make another run at the office. Conklin, progressive in his politics and deeply rooted in Santa Barbara’s environmental, business, and nonprofit circles, served four terms as a city councilmember through the 1980s before he was elected mayor. He was forced to step down, though, in 1994 when a court ruled he violated the city’s term-limit rule. 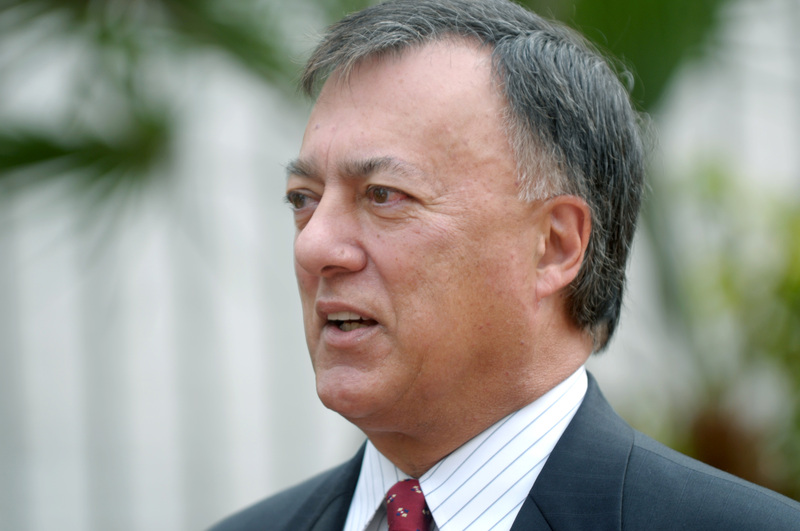 Now retired, Conklin worked as a Southern California government relations director for Edison for 17 years and served as a director on nearly a dozen different boards. After a 22-year hiatus from politics, former mayor Hal Conklin is seriously considering another run at the office. Conklin has the support of the Friends for the Future of Santa Barbara, a contingent of movers and shakers from all corners of the city, including Paul Relis, Sigrid Wright, Neil and Sue Ablitt, Pete and Gerd Jordano, Sharon Byrne, Karl Hutterer, and others. They’re led by environmental consultant Gary Petersen, who pointed to Conklin’s laundry list of accomplishments as a public servant. “He saved the wharf, improved State Street, got Paseo Nuevo built, worked on the Granada — it goes on and on,” Petersen said. That’s on top of his work with Relis in the ’70s to expand the state’s recycling program, as well as his track record of historic conservation and support of the arts. Councilmember Bendy White has also expressed interest in running, though he says he’s still marinating on the idea. Political prognosticators have named Councilmember Jason Dominguez as a potential candidate, but he’s denied the possibility. Both are Democrats. Conklin said he has not yet started fundraising. According to the most recent campaign finance statements, Murillo has so far collected $12,438 and brought over another $9,470 from her 2015 council campaign. She said her goal is to raise no less than $100,000 by November. The deadline to file for candidacy will be sometime this summer, according to the City Clerk’s Office.